The photon freedom micro is the top of the line keychain light from LRI; the original creators of this kind of keychain lights. The freedom evolves from the photon microlight II and III combining all the features of the photon III in a single button interface. The interface works as follows: from off you can turn the light on pressing the button and it will turn on on maximum brightness, you can then press the button and keep it pressed to dim the light. From off you might also turn the light by keeping the button pressed, then the light turns on in minimum mode and you can then press the button and keep it pressed to make it brighter. Once you reach maximum or minimum brighness mode keeping the button pressed you enter the flashing, strobe and SOS modes. From off you might also press the button several times quickly to access a signaling or momentary on mode, in this mode the light is off but every time the button is pushed the led flashes useful for morse if you know morse for example. The freedom is available in different color cases: black, red, blue, camo, purple and you can choose several different led colors for the light: white, red, purple, blue, green, yellow, organge, turquoise, UV or IR. The lights are powered by one or two C2032 coin cells, they are of course shockproof and splashproof. The freedom is probably the ultimate keychain flashlight, it offers multiple brightness levels, several useful modes and a nice interface taking almost no space from your keychain. They retail for about $20 and you can read more information in LRI's Photon Freedom official website. 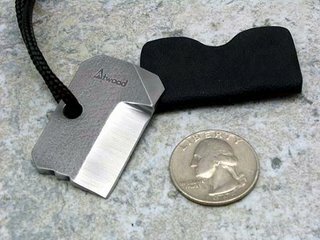 This is a very small card-style knife, it is made in S30V steel by Peter Atwood. One of the corners is machined to work as a screwdriver for extra functionality. The tool includes a kydex sheath. The size is really small (see side by side picture with a quarter) and the blade is so good that you can use it for many different things such as opening boxes, cutting cord, chopping jobs etc. The kydex sheath has a lateral pull system so you can carry this in your keychain if you want but being as small as it is you can fit it anywhere. The price is $60 and you can find more information at Peter Atwood's website. The M2 is the smallest waistpack from Maxpedition. This pouch is constructed in super strong cordura nylon, it has a main compartment with a double zipper and a smaller front compartment that closes with a buckle. Inside the main compartment there are small flat pockets for cards, ids and other small items. The compartment itself can carry a PDA, notepad and other items, the pouch is small in size but has a very good volume so you will be surprised by the number of things you can carry. The front compartment is good for a cellphone, multitool, flashlight or other items that you want to access quickly. There are two bottomless pen pockets in the sides for pens and pencils that have a pocket clip. The pouch can be attached to the belt using the loops in the back and it can also be attached to a backpack or bag using Malice clips. There are both horizontal and vertical attachment points in the back of the pouch. The price for the M2 is $22 and you can find more information at Maxpedition official site. 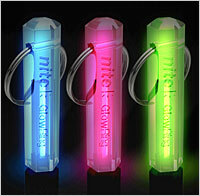 These are tritium filled glowrings. They glow for about 10 years without the need of light or any kind of charge; they glow using a microscopic amoung of radioactive tritium inside a glass vial. The vial is enclosed in a polycarbonate casing. The polycarbonate case has a small cap at the bottom that might get loose if the glowring impacts against a hard surface so it can be a good idea to use a drop of glue to be safe. The tritium is harmless even if the vial gets broken the gas would just disipate in the air without any trace. So they are as safe as any other toy you can add to your keychain. They are great to locate things in the dark, no batteries, no need of light, nothing to worry about. The green is the brighter one followed by the blue and finally the pink(ish) version. If you want maximum visibility get the green one. They are very difficult to get, so I will point to a very good seller in the EDC forums that has several offers, a common price for the glowrings ask for offers. If you want to visit the official product page you can follow this link. Tritium products might be restricted in your country, please follow your local laws. Clips are useful for several purposes, there are many variations and qualities and the ones produced by Berkeley Point offer a very good combination of quality, variety, availability and price. The clips from BP come in 4 different sizes from larger to smaller: Mini clip, Micro Clip, Nano Clip, Pico Clip. 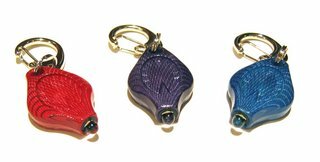 The largest one: the Mini clip can be used to clip keychains or items to belt loops, the smallest one is really tiny and is good to attach small things to splitrings for easy removal. The price starts at $2.25 for the pico clip and goes up to $3.25 for the Mini clip. Using them is a question of imagination, the most basic usage is to use a very small splitring to attach the clip to some item and then be able to clip the item to different objects, belt loops, splitrings, keychains, lanyards, neck chains, ball&chain, etc. They are made of stainless steel and the quality is very high, you can order them and find more information in Berkeley's Point Website. 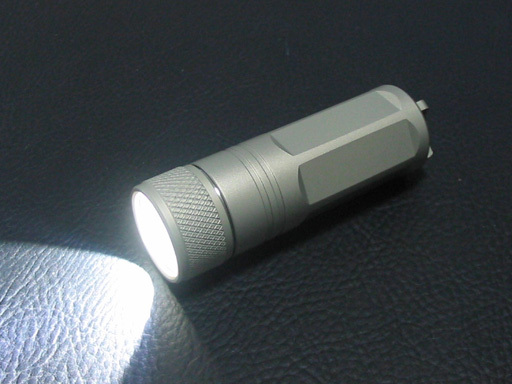 The Fenix P1 is a very small Luxeon III flashlight powered by one C123 lithium battery. The flashlight is turned on and off twisting the head, it is built using HAIII aluminium so it's very resistant to scratches and other impacts, it is also water resistant but not suitable for diving. It's a very bright light and very small so the output per size ratio is really amazing, not as bright as the Orb Raw but brighter than many other 1 cell flashlights. The runtime is about 2 hours of constant regulated brighness with one C123 cell. The P1 can also be used with 3.7 rechargeables and then the light will be even brighter. Note that the manufacturer does not recommend rechargeables but I use the P1 with R123s without any problems at all. If you already have an EDC flashlight the P1 is an excellent backup light and you can use it to "carry" a spare battery since the best way to carry a spare battery for your flashlight is another flashlight. You can get it in natural (picture) or black finish from Fenix-Store for about $45.